For some reason the notion that Gardner was not supportive of the Kavanaugh nomination gained steam over the past week. In a statement released by the Senator’s office yesterday, he put that lie to bed. The Colorado Federation of Republican Women reached out to one of Gardner’s representatives in the state, and received a firm response: “Totally false.” Gardner went on to say through his spokesperson that there is no one in D.C. or the mainstream press that believes he is against Kavanaugh. Gardner also mentioned that the ACLU is investing $1 million to smear him about this matter. 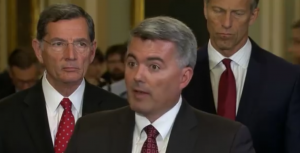 So barring some dramatic unforeseen turn, rest assured Colorado, Senator Gardner will support the Kavanaugh nomination.